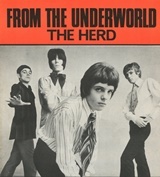 It’s hard to think of the rock legend Peter Frampton as the leader of a teeny bop band, but they all had to start somewhere and in 1967, The Herd, for whom he was the lead singer, were voted, in Disc magazine, the Brightest Hopefuls for 1968 and Frampton, with his good looks, was voted The Face of ’68 by Rave magazine. The original group were formed in 1965 in south London and were a five-piece comprising lead singer/ guitarist Terry Clark, Louis Cennamo on bass, Tony Chapman on drums, Andy Bown on keyboards and Gary Taylor on rhythm guitar, they signed a deal with EMI record and released three singles, Goodbye Baby Goodbye, She Was Really Saying Something and So Much in Love on their Parlophone subsidiary, which all went nowhere. In late 1966, Tony, Terry and Louis all decided they’d had enough and all left more or less at the same time. The remaining two members brought in a fresh new 16-year-old singer Peter Frampton and Andrew Steele to replace Underwood on drums. Unusually, for that period, their record label didn’t want to continue, but Fontana were happy to give them a go. The band asked songwriters Ken Howard and Alan Blaikley to write some material for them as they’d already how success with the Honeycombs and Dave Dee, Dozy, Beaky, Mick & Tich. It’s not often Greek mythology cracks the top 10, but the first song they came up with was From The Underworld, which is based on the Orpheus and Eurydice from Jacques Offenbach’s Orpheus in the Underworld and was written in 1858. It is said to be the first classical full-length operetta and was first premiered on 21st October 1858 at the Théâtre des Bouffes-Parisiens in Paris. The original piece tells the story of Orpheus, a renowned musician, and his wife Eurydice who, whilst fleeing from Aristaeus, she got bitten by a serpent and died. He was so devastated over her death and could do no more than sing very mournful songs, but the way he sang them made all the Nymphs, Gods and Furies in the underworld cry; in return, they gave him advice. It even melted the hearts of Hades, the God of the Underworld, and his wife, the Goddess Persephone. He played his lyre which impressed them and in return it was agreed that Eurydice could be allowed to come back into life but only on the condition that as they leave she is to walk behind him and he is not to turn round and look back. Howard and Blaikley portrayed this in the lyrics as ‘I heard you whisper in my ear, if you should turn now, all that you won will vanish just like a passing dream.’ Unfortunately, his did look back and Eurydice vanished forever. The song reached number six in the UK and number three in the Netherlands and the band asked the pair to write a follow-up. That song was Paradise Lost, a title borrowed from another historic works, a poem by John Milton. It reached number 15 in the chart. Their third and final hit was I Don’t Want Our Loving to Die which became their biggest hit when it peaked at number five in May 1968. Towards the end of 1968, the band were falling apart. They dispensed with their songwriter and replaced them with Harvey Lisberg, but he wasn’t able to stand the arguing and ongoing problems so he left too. Frampton wasn’t happy with the ‘teen idol’ tag and left to form Humble Pie with Steve Marriott. Bown finally departed and joined Status Quo and Taylor continued to work with Gerry Rafferty. Howard and Blaikely, together or separately, wrote other hits for Lulu, Marmalade, Rolf Harris and their last hit together was I’ve Lost You, which Elvis Presley took to number nine in 1970. After Humble Pie, Frampton launched a solo career and had his biggest success in 1976 with the top 10 hit Show Me The Way and the follow-up, Baby I Love Your Way which bizarrely failed to make the top 40, however the parent album, Frampton Comes Alive, reached number eight, spent 39 weeks on the chart and became the biggest-selling live album in UK chart history.